Under new ownership as of January 23, 2017. 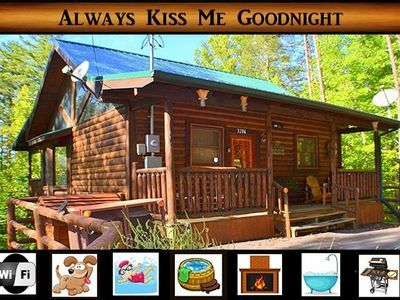 We are excited to offer you our dream cabin. Away From The World has so much to offer a family. 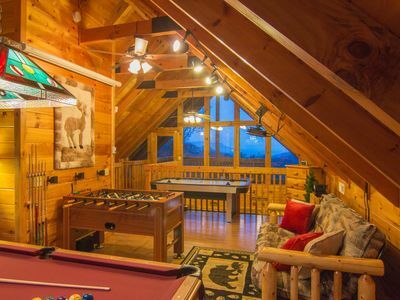 You truly feel like you can get "Away from the World" in this beautiful cabin featuring gorgeous mountain views, a relaxing hot tub, jacuzzi tubs, and a game room with a pool table and a large screen TV viewing area. There is something for everyone. 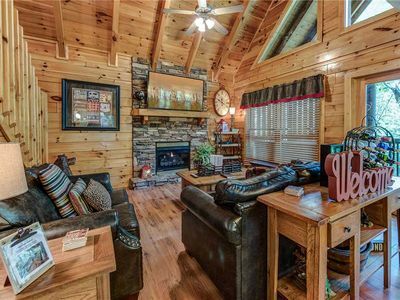 6 Flat screen HD TVs, 3 Blu Ray or DVD players, charcoal grill, and paved access makes this a perfect cabin for your group. 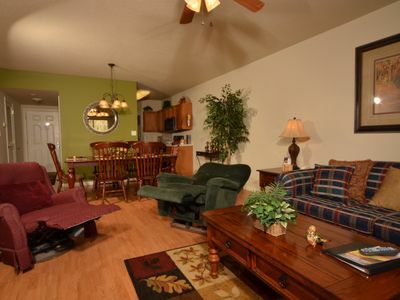 Overview: Main Level - Living Room with 2 Sleeper Sofas and Gas Fireplace, Kitchen, Dining Area, King Bedroom with Full Bath featuring a Jacuzzi tub and separate Half Bath. 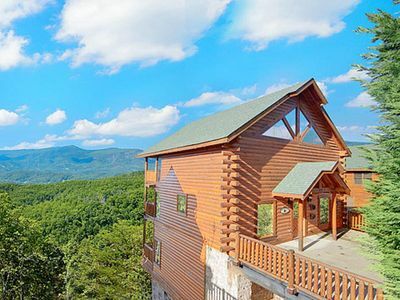 Upper Level - Loft with 2 Queen beds with a full bath and incredible mountain views Lower Level - Game Room with 2 Sleeper Loungers, 1 King Bedroom, 1 Queen Bedroom, Full Bath with Jacuzzi tub, Theater Area with 65 inch HD TV and Blu ray player. 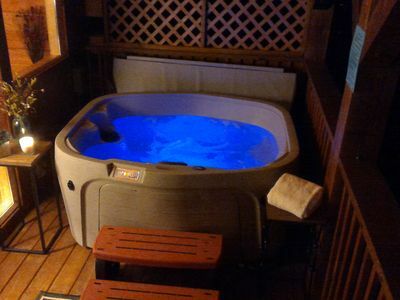 The Hot tub is located on the lower deck. 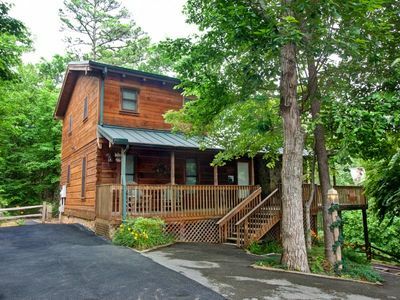 We are in the process of several upgrades to the cabin. Upgrades so far include new furniture and new mattresses and bedding in most bedrooms. 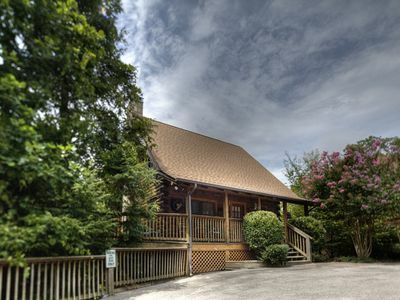 For the family who is looking to do more than hang out at the cabin, there are many attractions and activities nearby. 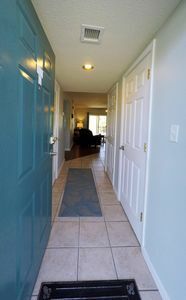 There is a catch and release fishing pond and a large swimming pool as you enter onto Happy Hollow Road that guests will have access to at no additional charge. 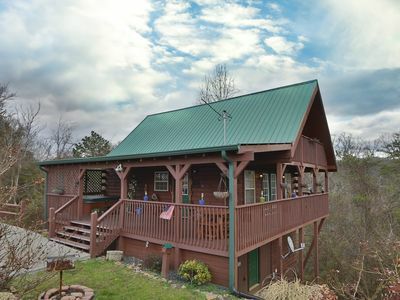 This is located approximately 2 miles from the cabin. 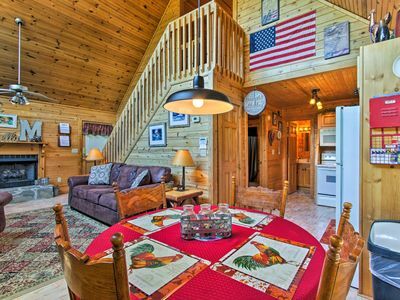 We have a couple of fishing poles at the cabin for guests to use, but feel free to bring your own. The swimming pool is normally open mid-May through October 1, pending weather conditions. There is a concession area at the pool featuring a nice deli menu. 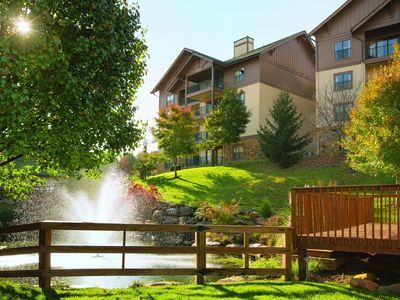 It is 10 miles to the Parkway in Pigeon Forge, where you will find numerous attractions, and 6 miles to Townsend where you will find bike and walking trails, river tubing and other activities. 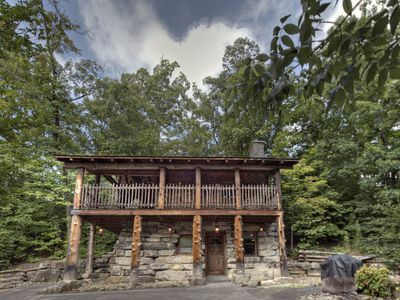 The National Park is just 5 minutes away if you take the Lyons Springs Road into the park. Many people are not aware that this is a true shortcut into the park with little traffic. 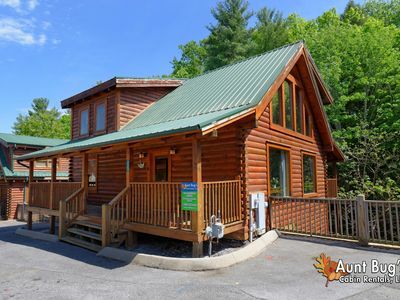 This cabin is in a central location to the surrounding attractions. 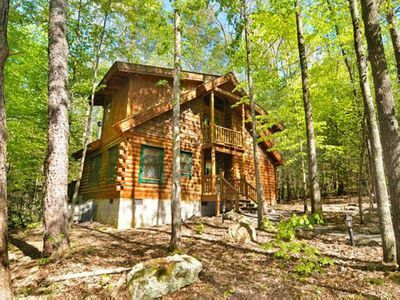 Motorcycle enthusiasts will love this cabin. 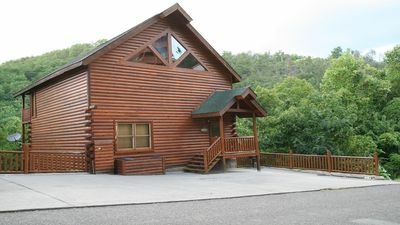 We enjoy riding in this area and the flat parking was a major draw to this cabin. There is room for a trailer and 3 vehicles to park on a level surface, still leaving room for the bikes. The Tail of the Dragon is just 30 minutes away. There are many other places to adventure to as well that are nice day trip rides. 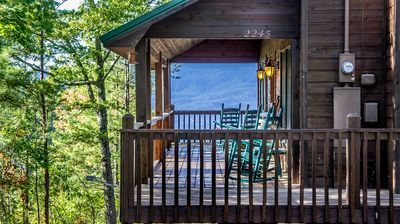 After a day out riding, come back and sit on the porch and enjoy the view or jump in the hot tub and relax. 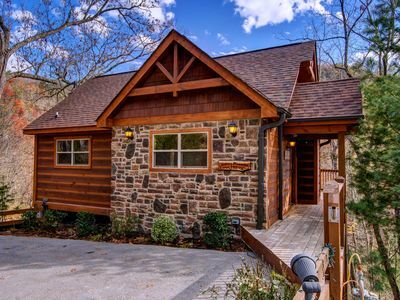 Located 10 mins from light #3 in Pigeon Forge: go down Wears Valley Road about 10 miles, turn on Happy Hollow Road & cabin will be located in 2 miles. MAY 15 - 18TH OPEN! VIEWS FOR MILES! PRIVATE! LOFT GAMEROOM W/THEATER! FIREPIT! 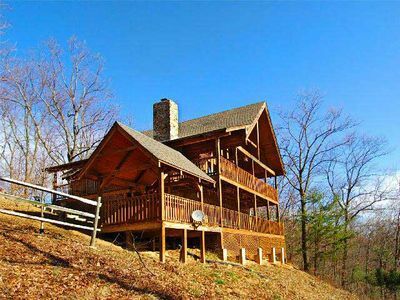 A cozy retreat with Gorgeous Views to behold! 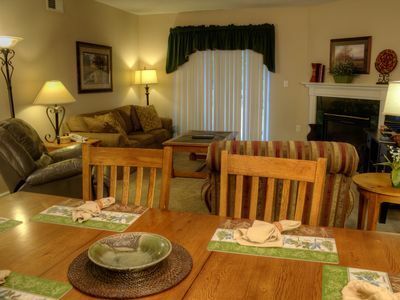 ER 247 – Legacy Lodge | Great Location – Close to town! ER69 - Rachel's Tree House - Great location...close to all the action!